Haitian Creole language (kreyòl ayisyen), often called simply Creole, is a language spoken in Haiti by about 8.5 million people (as of 2005), which is nearly the entire population, and via emigration, about 3.5 million speakers who live in other countries, including Canada, the United States, France, and many Caribbean nations, especially the Dominican Republic, Cuba, and the Bahamas. Haitian Creole is one of Haiti's two official languages, along with French. It is a creole based primarily on French, but it also contains various influences, notably the native Taíno, some West African and Central African languages, Portuguese and Spanish. The language has two distinct dialects: Fablas and Plateau. Guyane, Martinique, Guadeloupe as well as Saint Lucia and Dominica, also speak Creole, with some local variations. Haitian creole tends to move away from original creole under the influence of English introduced by Haitian working in USA. 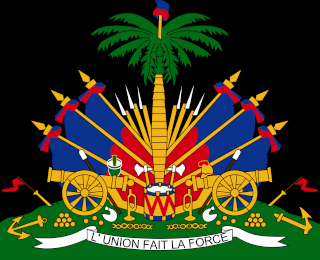 In part because of the efforts of Félix Morisseau-Leroy, since 1961 Haitian Creole has been recognized as an official language along with French, which had been the sole literary language of the country since its independence in 1804, and this status was upheld under the country's constitution of 1987. Its usage in literature is small but increasing, with Morisseau being one of the first and most significant examples. Many speakers are trilingual, speaking Haitian Creole, Spanish, and French. Many educators, writers and activists have emphasized pride and written literacy in Creole since the 1980s. Today there are numerous newspapers, as well as radio and television programs, in Creole. Haitian Creole is used widely among Haitians who have relocated to other countries, particularly the United States and Canada. Some of the larger population centers include Montréal, Québec, where French is the official language, and parts of New York City, Boston, Central and South Florida (Miami, Fort Lauderdale, and Palm Beach). Various public service announcements, school-parent communications, and other materials are produced in this language by government agencies. Miami-Dade County in Florida sends out paper communications in Haitian Creole in addition to English and Spanish. Announcements are posted in the Boston subway system and area hospitals and medical offices in this language. HTN, a Miami-based television channel, is North America's only Creole-language television network. The Miami area also features over half a dozen Creole-language AM radio stations. There is some controversy as to whether or not Creole should be taught in Miami-Dade County Public Schools. Many argue Creole is a peasant language which is not important, while others argue it is important for children to know their parents' native tongue. Haitian Creole language and culture is taught in many Colleges in the United States as well as in the Bahamas. Indiana University has a Creole Institute founded by Dr. Albert Valdman  where Haitian Creole, among other facets of Haiti, are studied and researched; the University of Kansas, Lawrence has an Institute of Haitian studies, founded by Dr. Bryant Freeman. Additionally, the University of Massachusetts-Boston and University of Florida offer seminars and courses every year under their Haitian Creole Summer Institute. More universities such as Brown University, Columbia University, and University of Miami offered numerous classes in Haitian Creole. Haitian Creole has ten vowels as opposed to standard French's twelve. This is primarily due to the loss of front rounded vowels. In Creole, these French phonemes are usually merged with their unrounded counterpart. Hence, /y/ becomes /i/ and /ø/ becomes /e/. French's uvular rhotic either becomes an alveolar trill /r/, or /w/, or is elided altogether, depending on the environment. Being formed relatively recently, Haitian Creole orthography is mostly phonemic, and is similar to the International Phonetic Alphabet (IPA). The main differences are j = /ʒ/, y = /j/, è = /ɛ/, ou = /u/. Nasalization is indicated by a following n.
Most of the lexicon is derived from French, with significant changes in pronunciation and morphology. Often, the French definite article was retained as part of the noun. For example, the French definite article la in la lune ("the moon") was incorporated into the Creole noun for moon: lalin. bagay /bagaj/ (?)Fr. bagage, "baggage" "thing"
bannann /bãnãn/ Fr. banane, "banana" "plantain"
bekàn /bekan/ Fr. bécane /bekan/ "bicycle"
Bondye /bõdje/ Fr. Bon Dieu /bõdjø/ "God! Good Lord!" dèyè /dɛjɛ/ Fr. derrière /dɛʁjɛʁ/ "behind"
diri /diri/ Fr. du riz /dyʁi/ "rice"
fig /fig/ Fr. figue "banana"
la-kay /kaj/ (?)Fr. cahutte /kayt/ "house"
kle /kle/ Fr. clé /kle/, "key" "wrench" or "key"
kle kola /kle kola/ Fr. clé /kle/, "key" + Eng. "cola" "bottle opener"
konnflek /kõnflek/ En. "corn flakes" "breakfast cereal"
kawoutchou /kawutʃu/ Fr. caoutchouc, "rubber" "tire"
lalin /lalin/ Fr. la lune /lalyn/ "moon"
makak /makak/ Fr. macaque /makak/ "monkey"
matant /matãt/ Fr. ma tante, "my aunt" "aunt"
moun /mun/ Fr. monde "people/person"
mwen /mwɛ̃/ Fr. moi, "mwen meme" "me","I","myself"
nimewo /nimewo/ Fr. numéro /nymeʁo/ "number"
ozetazini /ozetazini/ Fr. aux États-Unis /ozetazyni/ "the United States"
pann /pãn/ Fr. pendre "to hang"
pwa /pwa/ Fr. pois /pwa/, "pea" "bean"
tonton /tõtõ/ fr. oncle "uncle"
vwazen /vwazɛ̃/ Fr. voisin /vwazɛ̃/ "neighbor"
zwazo /zwazo/ Fr. les oiseaux /lezwazo/ "birds"
zye /zje/ Fr. les yeux /lezjø/ "eyes"
(*) A banana which is short and fat, not a plantain and not a conventional banana; regionally called "hog banana" or "sugar banana" in English. (#) The relationship shared between a child's mother and godmother. (^) The gap between a person's two front teeth. Many trade marks have become common nouns in Haitian Creole (as happened in English with "aspirin" and "kleenex", for example). pampèz (Pampers) — "nappy" or (Am) "diaper"
cutex (Cutex) - "nail polish"
asetonee (Acetone) - "nail polish remover"
fé back to move backwards, napkin are example of words adopted in Haitian Creole, pushing out original creole words. The term nèg literally means a dark-skinned man and the word blan a white person, as in Gen yon nèg e gen yon blan. ("there is a black man and there is a white man"). However, nèg is generally used for any man, regardless of skin color (i.e. like "guy" or "dude" in American English). Blan is generally used for foreigner. It is not used to refer just to white foreigners, but foreigners of other races as well. There are many other Haitian Creole terms for specific tones of skin, such as grimo, bren, wòz, mawon, etc. However, such labels are considered offensive by some Haïtians, because of their association with color discrimination and the Haitian class system. Haitian Creole grammar differs greatly from French and inflects much more simply: for example, verbs are not inflected for tense or person, and there is no grammatical gender — meaning that adjectives and articles are not inflected according to the noun. The primary word order (SVO) is the same as French, but the variations on the verbs and adjectives are minuscule compared to the complex rules employed by French. Many grammatical features, particularly pluralization of nouns and indication of possession, are indicated by appending certain suffixes (postpositions) like yo to the main word. There has been a debate going on for some years as what should be used to connect the suffixes to the word: the most popular alternatives are a dash, an apostrophe or a space. It makes matters more complicated when the "suffix" itself is shortened, perhaps making only one letter (such as m or w). 1/singular mwen m je, me, moi "I", "me"
3/singular li l il, elle "he", "she"
1/plural nou n nous "we", "us"
3/plural yo y ils, elles, eux "they", "them"
(*)sometimes ou is written as w- in the sample phrases, w indicates ou. (**) depending on the situation. Nouns are pluralized by adding yo at the end. Possession is indicated by placing the possessor after the item possessed. This is similar to the French construction of chez moi or chez lui which are "my place" and "his place", respectively. lajan li - "his/her money"
fanmi mwen or fanmi m - "my family"
kay yo - "their house" or "their houses"
papa ou or papa w - "your father"
chat Pyè - "Pierre's cat"
chèz Mari - "Marie's chair"
zanmi papa Jan - "Jean's father's friend"
papa vwazen zanmi nou - "our friend's neighbor's father"
yon kouto - "a knife"
yon kravat - "a necktie"
kravat la - "the tie"
liv la - "the book"
kay la - "the house"
lanp lan - "the lamp"
ban lan - "the bench"
kouto a - "the knife"
peyi a - "the country"
fanmi an - "the family"
mi an - "the wall"
chen an - "the dog"
pon an - "the bridge"
machin nan - "the car"
telefòn nan - "the telephone"
madanm nan - "the woman"
jaden sa (a) bèl- "This garden is beautiful." sa se zanmi mwen - "this is my friend"
sa se chen frè mwen - "this is my brother's dog"
Many verbs in Haitian Creole are the same spoken words as the French infinitive, but they are spelled phonetically. As indicated above, there is no conjugation in the language; the verbs have one form only, and changes in tense are indicated by the use of tense markers. Li ale travay le maten - "He goes to work in the morning." Li dòmi le swa - "He sleeps in the evening." Li li Bib la - "She reads the Bible." Mwen fè manje - "I make food." Nou toujou etidye - "We study all the time." The concept expressed in English by the verb "to be" is expressed in Haitian Creole by two words, se and ye. Li se frè mwen - "he is my brother"
Mwen se doktè - "I am a doctor"
Sa se yon pye mango - "That is a mango tree"
Nou se zanmi - "we are friends"
Se yon bon lide - "That is a good idea"
Se nouvo chemiz mwen - "This is my new shirt"
For the future tense, such as "I want to be", usually vin "to become" is used instead of se. L ap vin bel frè mwen - "He will be my brother-in-law"
Mwen vle vin yon doktè - "I want to become a doctor"
S ap vin yon pye mango - "That will become a mango tree"
N ap vin zanmi - "We will be friends"
Ayisyen mwen ye = Mwen se Ayisyen - "I am Haitian"
Ki moun sa ye? - "Who is that?" Kouman ou ye? - "How are you?" M gen yon zanmi malad - "I have a sick friend." Zanmi mwen malad. - "My friend is sick." Mwen genyen lajan nan bank lan - "I have money in the bank". The verb genyen (or gen) also means "there is/are"
Gen anpil Ayisyen nan Florid - "There are many Haitians in Florida". Gen yon moun la - "There is someone here". Pa gen moun la - "There is nobody here". Mwen genyen match la- "I won the game". Èske ou konnen non li? - "Do you know his name?" Konn or konnen also means "to know" + a fact (cf. French savoir). the actions, but also some experience with it. as it is one of the most common verbs used in idiomatic phrases. Kouman ou fè pale kreyòl? - "How did you learn to speak Haitian Creole?" Mari konn fè mayi moulen. - "Marie knows how to make cornmeal." similar to the French "capable". Mwen ka ale demen - "I can go tomorrow." Petèt m ka fè sa demen - "Maybe I can do that tomorrow." Mwen pale kreyòl - "I speak Haitian Creole"
mwen manje - "I ate"
ou manje - "you ate"
li manje - "he/she ate"
nou manje - "we ate"
yo manje - "they ate"
(Note that manje means both "food" and "to eat" -- m ap manje bon manje means "I am eating good food"). mwen te manje - "I ate" or "I had eaten"
ou te manje - "you ate" or "you had eaten"
li te manje - "he/she ate" or "he/she had eaten"
nou te manje - "we ate" or "we had eaten"
yo te manje - "they ate" or "they had eaten"
men t ap manje - "I was eating"
ou t ap manje - "you were eating"
li t ap manje - "he/she was eating"
nou t ap manje - "we were eating"
yo t ap manje - "they were eating"
m ap manje - "I am eating"
w ap manje - "you are eating"
l ap manje - "he/she is eating"
n ap manje - "we are eating"
y ap manje - "they are eating"
M ap manje kounye a - "I am eating right now"
mwen pral manje - "I am going to eat"
ou pral manje - "you are going to eat"
li pral manje - "he/she is going to eat"
nou pral manje - "we are going to eat"
yo pral manje - "they are going to eat"
Mwen te wè zanmi ou yè - "I saw your friend yesterday"
Nou te pale lontan - "We spoke for a long time"
Lè li te gen uit an... - "When he was eight years old..."
M a travay - "I will work"
M pral travay - "I'm going to work"
N a li l demen - "We'll read it tomorrow"
Nou pral li l demen - "We are going to read it tomorrow"
Mwen t ap mache e m wè yon chyen - "I was walking and I saw a dog"
Mwen fèk sòt antre kay la - "I just entered the house"
Yo ta renmen jwe - "They would like to play"
Mwen ta vini si mwen te gen yon machin - "I would come if I had a car"
Li ta bliye w si ou pa t la - "He/she would forget you if you weren't here"
Woz pa vle ale - "Rose doesn't want to go"
Woz pa t vle ale - "Rose didn't want to go"
kouman/kijan ou rele? - what is your name? ki pèz ou (genyen)?- what is your weight? sa ka fèt / sa k ap fèt - how's it going? sa k pase - what's up?